This Prize Wheel Transporter Keeps Gear Protected. Each Custom Container Carrys a Fully Assembled, Spin Game! 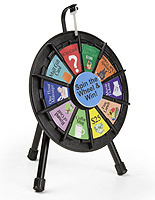 A Prize Wheel that is Outfitted with a Carrying Case Makes it Easier to Travel! Interior lining stops equipment from rocking around within cases. 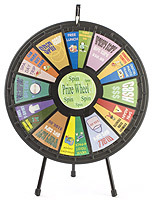 Small size holds a 20-1/2" diameter mini prize wheel perfectly. Adaptable shoulder strap makes carrying cases easy. Plastic cases weigh only 10 pounds when empty! 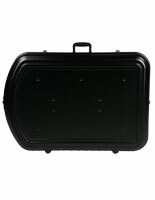 These carriers are designed to store the mini prize wheel during travel (please see related products). These custom shipping containers give users freedom to carry gaming equipment while commuting. 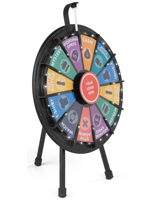 These prize wheel carrying cases include foam inserts to prevent gaming supplies from moving around within a case. The spinning game transport containers each hold one mini model, completely set up and put together. 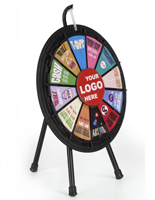 This means your promotional games are instantly ready for use upon arrival. Carrying cases, as shown here, are equipped with a 2" wide adjustable shoulder strap to carry a container with ease, while walking. This is so users can have free hands while traveling. These gaming display holders, prize wheels also include three draw latches to make sure shipping cases remain closed. The ABS plastic construction provides a durable yet lightweight container. 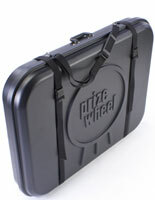 Carrying cases have a hinged design to easily open and insert a 20-1/2" wide mini prize wheel. These shipping containers give users freedom to carry gaming equipment to an affair. 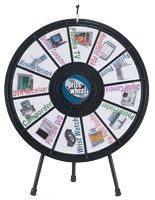 The carrying cases are useful for retail stores, bars, hotels and restaurants as temporary promotions may require the use of portable carnival game. Corporate event planners and trade show exhibitors would also benefit from using these shipping containers as presentational tools could become damaged during travel, if not taken care of properly. Carrying cases are crucial accessories needed to continuously use your gaming equipment over and over again! Please Note: This is a transport case only! Also the case is intended for carrying only & should not be used for shipping without additional protection. 33.0" x 23.5" x 20.0"
Ordered a prize wheel and carrying case. Carrying case is the wrong size. Says I need a return form in order to return it. No form came with the order, tried to download it and it won't let me. Emailed the company and no response. I'd like to return this case so that I can order the correct case. But I will not order the correct case until I'm able to return the incorrect one. Not very customer friendly when there is a problem or something needs returned. We are very sorry to hear that you weren't happy with your recent experience, Lorna. One of our customer care representatives will contact you promptly.